Going on a Gluten-Free diet seems to be the latest diet craze, or even cutting ALL grains out completely. With this new diet trend comes the promise that we will lead healthier, thinner and more energetic lives. But is this really true, and why, all of a sudden, are wheat and other grains being demonized? Before deciding to jump on the gluten-free train, please read ahead to have a better understanding of whether this is actually a nutritional approach you should take in your own life. 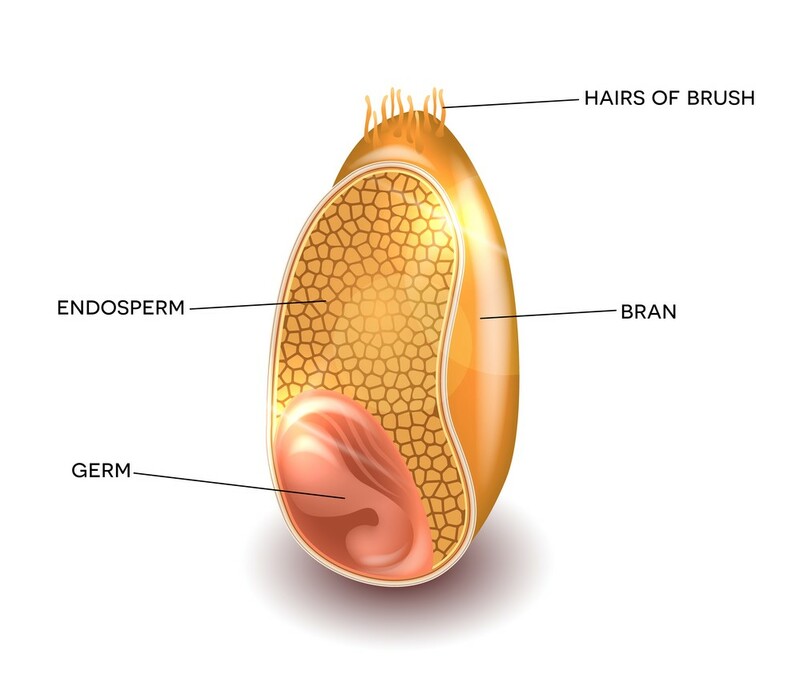 As you can see, within the husk of plants in the grass family, there are three parts to a grain; the outer layer, or Bran, the middle layer or Endosperm and the inside layer, or Germ. So why is this important to understand? Well, the Prolamin in wheat gluten (Gliadin) is what causes Celiac Disease and Gluten Sensitivity/Intolerance and the Glutelin in wheat (Glutenin… why these names had to be SO similar I have no idea!) is the main cause of wheat allergies. There are roughly 55 diseases that have been linked, so far, to gluten sensitivity. Is an autoimmune disease that affects the small intestine. In all people, the Prolamin in wheat, rye and barley can not be broken down through digestion. In most cases this does not cause any issues, but in people with CD, the gluten protein interacts with a certain enzyme in the lining of the small intestine. This interaction triggers the body’s immune system to attack the lining of the small intestine, causing massive damage to the micro-villi (hair-like structure) in the small intestine, responsible for absorption of key nutrients. The only treatment for CD is a 100% gluten-free diet. Untreated CD eventually causes deprivation of vital nutrients to your brain, nervous system, bones liver and other organs and will often lead to malnourishment, other autoimmune diseases, osteoporosis, Type 1 Diabetes, thyroid disease, adenocarcinoma, and lymphoma of the small intestine. Usually people with CD exhibit gastrointestinal symptoms such as cramping, bloating, chronic constipation, or diarrhea. Disturbingly, more and more people are testing positive for CD without exhibiting any of these gastrointestinal symptoms, but instead have more vague symptoms of fatigue, body aches and anemia. The cause of CD is both genetic and environmental. People prone to CD have certain genes, but they may not be activated until late adulthood, and usually are activated by an environmental factor such as pregnancy, surgery, viral infection or severe emotional distress. Again, the ONLY treatment for CD is a 100% gluten-free diet for life. Even so much as a crumb of wheat can create issues for people with CD. Although both wheat allergy and Celiac Disease involve the immune system, the two should not be confused. Wheat allergy is most common in children, and is usually outgrown before adulthood. As with other allergies, symptoms are immediate and can range from mild such as hives and rashes, to severe, such as anaphylaxis. There are many different components to wheat, and not everyone with a wheat allergy reacts to the same thing. Researchers have identified 27 different potential wheat allergens, one of which can be gluten. Celiac Disease and wheat allergy is NOT the same thing. With Wheat allergy, the body’s immune system overreacts to a component of wheat identifying it as a harmful foreign substance, deploying the body’s antibodies against the wheat component, itself. In Celiac Disease, there is only one component involved: the Prolamin portion of gluten in wheat, rye and barley that reacts with the body in such way, that triggers the immune system to attack exactly what its trying to defend – the body itself – causing an autoimmune disorder. Note: the term “gluten allergy” is not an actual thing. Or gluten sensitivity, also involves the immune system, and often has similar symptoms to Celiac Disease, without the severe damage to the intestine. Even though there is not severe damage, the intestine is still affected, to some degree, by inflammation and malabsorption of nutrients. Unlike Celiac Disease, inflammation is not just contained to the digestive tract, and can cause wide-spread inflammation and autoimmune responses throughout the body. This means gluten intolerance can manifest itself in many ways, that may not even involve digestive tract symptoms. In fact, gluten intolerance has been connected to many other diseases. 1. Sjogrn’s Syndrome – Autoimmune disease that affects the glands that produce tears and saliva. Main Symptoms: Dry, burning, itching eyes with blurry vision or light sensitivity; Dry, chalky, cotton mouth, with difficulty swallowing, speaking or tasting, dental decay and mouth infections. 2. Fibromyalgia – Chronic widespread muscle and connective tissue pain, debilitating fatigue, joint stiffness, and sleep disturbance. 3. Osteoporosis – due to malabsorption of vitamins (vitamin D in particular), minerals and other micronutrients. 4. Psudogout – type of arthritis that mimics gout causing severe episodes of localized pain, most often in the knees but also in wrists, elbow, shoulders and hands. This is, again, caused by Vitamin D deficiency related to malabsorption in the gut. So this is a pretty intense list of stuff! The good news is that if the diseases, listed above, are due to gluten sensitivity, the disease can often be completely reversed by going gluten free. I Thought Gluten-Free Diets Helped with Weight Loss! For those suffering from Celiac Disease, rapid weight loss is actually one of the symptoms with continued consumption of gluten, but NOT a good symptom, because the weight loss is a direct result of your small intestine being damaged and unable to absorb nutrients. By continuing to eat gluten, an individual with CD is actually in a form of starvation. In situations where people have gluten sensitivity, weight gain is a very common problem. Why is this? Well when there is widespread inflammation, your body is in a state of stress, which causes increased levels of cortisol (“the stress hormone”) elevated blood sugar levels and elevated insulin levels. When cortisol and insulin are chronically elevated for a continuous amount of time, your body is much more likely to store fat, and over time, develop insulin resistance. Eliminating the inflammatory-causing gluten can result in weight loss for those who are actually suffering from gluten intolerance. My concern is that if you do in fact have gluten intolerance, weight should be the last thing on your list of concerns (as I clearly demonstrated through the list of related disease above) and going gluten-free should be a complete lifestyle change for you, not just a temporary diet to lose that last stubborn 10 pounds. Just because the food says “Gluten-Free” does not give it the automatic stamp of health, especially if its a processed food. Lets face it, processed foods are processed foods whether they contain gluten or not. For example, replacing pasta with organic, whole grain rice, or spaghetti squash is a great option. Picking up gluten-free cookies and thinking its okay to nosh away, is not a great option. Many gluten-free sweets, breads, and cereals are nothing but over processed corn, rice and potato starch which means empty calories, and spikes in blood sugar, resulting in hunger binges and sugar cravings…. and you got it, weight gain. So if you choose to go gluten free, don’t go hog wild on gluten-free stuff, thinking that its the new weight loss magic you’ve been looking for. You still gotta stick to avoiding the overly processed foods, and choose whole foods instead. Should you be Concerned? Do you have gluten issues? Or are you one of the lucky folks who tolerates gluten just fine? Well, glad you asked! Have you had persistent issues with any of the following? Stomach bloating, cramps, diarrhea, abnormal stool, or constipatioare false negative or positive. If you are negative for Celiac Disease, gluten intolerance can be a bit more challenging to diagnose. There is a blood test that can test your sensitivity to gluten plus many other foods. Check out FOOD SENSITIVITY TESTING for more information on food sensitivities and testing. A more involved process of testing for food sensitivities is to do a complete elimination of all gluten-containing foods from your diet, for a month and keep track of your symptoms. If your symptoms improve or clear up completely, while off gluten, and then worsen when you introduce gluten back into your diet, you more than likely should make the lifestyle change of removing gluten from your diet. The complicated part about elimination diets is that if you are or are also sensitive to another food, your symptoms may not go away until you take out all foods causing you inflammation. Is this something that may help you pinpoint the cause of your symtpoms? What Foods are Acceptable and What Foods are NOT Acceptable on a Gluten-Free Diet? You may be thinking that a gluten-free diet means just eliminating wheat from your diet. Even though wheat is a contribute of gluten this is not the only item you must remove. Rye and Barley are two other grains that must be avoided. This is not all, there are other products or cross-grains of Rye Barley and Wheat that must be avoided. Remember, Prolamins and Glutelins are the complexes that make up gluten in wheat rye and barley, and these prolamins are the main focus. Even though the common definition of gluten is the protein found in wheat, rye and barley, if you consider that the makeup of gluten is a type of prolamin combined with a type of glutelin, then in that respect, ALL grains have gluten. This makes gluten a somewhat vague term. In fact corn and oats have a very similar prolamin composition to the ones found in wheat, rye and barley. Although this was not a major issue in the past, more and more people are not recovering from Celiac Disease and Gluten Sensitivity with wheat, rye and barley elimination alone. In fact, more individuals with CD are also having to eliminate corn and oats. Makes you wonder, where will this end? Will we eventually have to go completely grain-free? Why Are Grains Having a Bigger Impact On Our Health? There is a great deal of inconclusive and controversial research and theories out there, often influenced by grain companies, lobbyists, and other interest groups who have a certain agenda for presenting their research. Nothing is conclusive yet, but based on what I’ve read and researched so far, my opinion is that the way in which our food supply has changed, and the way we eat is the main culprit. Our food supply has changed more within the past 50 years, than it has in the past 10,000 years, and genetically, our bodies can’t keep up! Well, to put it bluntly, get away from the processed CRAP out there. And don’t be fooled, just because the label says its healthy, if its processed, its processed. Drastically eliminate added sugars, eat whole foods, preferably organic, and if you think you have a sensitivity to gluten or any other grains then do the work it takes to pinpoint what is making you sick and GET RID OF IT. Is elimination of certain foods from your diet a challenge and potentially upsetting because you may have to do away with some of your favorite foods? Absolutely, but you must make the choice – eat anything you want and be ill, or eat what your body needs and be strong, healthy and gorgeous. Everyone’s body is different, and each individual needs to discover what works best for their bodies. There are “bad things” in foods everywhere we turn: gliadin and glutenin in wheat, avenin in oats, albumin in eggs. Green vegetables are full of oxalates, and cruciferous vegetables contain a lot of goitrogens that can affect your thyroid. Peaches, plums, apples and other stone fruits contain cyanide. Eating too much liver can cause heavy metal poisoning. Too much fish can lead to mercury poisoning. Many people are severely allergic to shell fish and nuts. Coconuts cause some major digestive issues in other people. Citrus fruits can weaken tooth enamel and bone. Dairy contains inflammatory whey and casein proteins, plus hard-to-digest lactose. Coffee and cocoa have some of the highest phytate levels of any foods. Red meat consumption has been linked to colon cancer and heart disease. Does this mean we just stop eating food? No, this means you must be aware, eat a balanced diet full of variety, and know your body. Some of these foods may not work for you, or maybe they all do. Learn to listen to your body, and treat allergies and autoimmune conditions seriously IF they apply to you instead of immediately jumping into the latest fad diet claiming that X, Y or Z will “kill you if you eat it”. Guess what? I have gluten intolerance and now follow a gluten and dairy (that’s another story for another time) free diet, so I know what its like to do the agonizing footwork to figure this all out. I also realize that plenty of people do splendidly on gluten and dairy products, and certainly don’t think that gluten and dairy free should be a journey we all have to go on. If you have more questions, or need the guidance of a registered dietitian experienced in this area, please feel free to contact me!